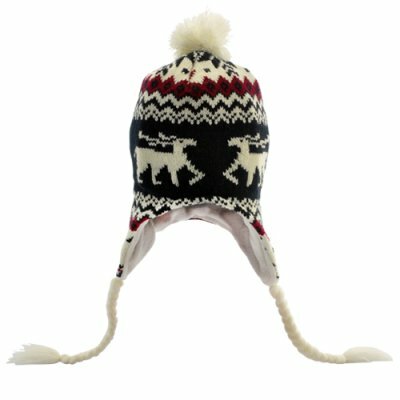 Successfully Added Bobble Beanie Hat with Braided Earflaps and Built-in Headphones - Kids/Women Fit to your Shopping Cart. Warm and cute, this Bobble Beanie Hat with Braided Earflaps and Built-in Headphones will keep your head warm and music flowing. This lovely deer-design bobble hat is made of 100% cotton and is a comfortable and snug fit over your head. Included inside are two high quality stereo headphones integrated in the inner layer, allowing you to enjoy music without letting that cold wind get in! These Beanie Headphones are great for outdoor type activities where earbuds and headphones just won't do; Appreciate the delicious harmony of music notes while commuting, jogging, skiing and whatever else. The braided earflaps on the side also provide extra warmth and cuteness. With a 3.5mm output, this friendly Bobble Beanie Hat’s headphones can be easily and quickly connected to most any audio device, like your MP3 and MP4 players, cell phone, iPhone, iPad and so on. Throw away these old earphones with coarse buds making your ears uncomfortable after a while and pitch on this beanie hat for maximum convenience and ease! Stay trendy with this warm Bobble Beanie Hat and its convenient headphones. Brought to you at an amazing low price by the online leader in electronics and cool gadgets, Chinavasion. Position of speakers is adjustable to best fit your ears. Very well made. Sound quality is better than expected. Very comfy inside. It is a tight fit made for a child or women. Will stretch a bit. Great Value!! Very tight fit as new,but stretches a little and earphones fall right in the ears,interior is nice and comfy,exterior is also very nice,heavy tricot.